Clearbra paint protection is an investment in the preservation of your car's paint and finish. 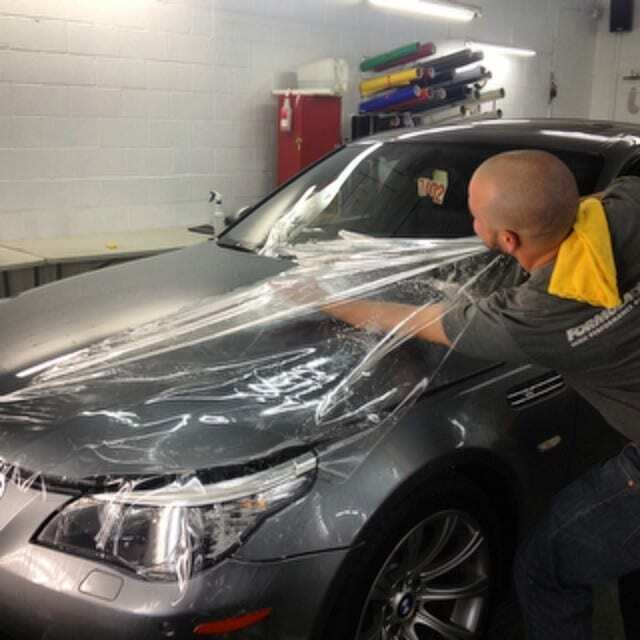 Rocky Mountain Auto Works in Sacramento offers LLumar automotive paint protection film, otherwise known as clearbra, to outfit your exterior so your car, SUV, truck, and even your motorcycle or boat can stand up to almost anything your journey has in store for it. Our automotive paint protection film is your car’s first line of defense on the road, protecting it against insects, rocks, debris, salt, and sand. Though virtually invisible to the naked eye, its high gloss shine and best-in-class quality ensure you know it’s there. Your car looks newer longer, boosting its resale value and your peace of mind. Industry-leading, highly durable LLumar paint protection film is up to 33% thicker than its competitors’ and is custom-matched to your vehicle. It self-heals when scratched and is guaranteed against yellowing, cracks and staining. Our clearbra won’t affect the true color of your car, but in fact, will make it look it even better. Plus, with up to a 10-year limited warranty, you can drive without worry for years to come. Rocky Mountain Auto Works uses LLumar and XPEL computer-generated paint protection film patterns and precisely trims each piece so you can be sure that your film will fit perfectly every time. And when it’s installed by us, you can wash, wax and care for your car just like you normally would. For Car Paint Protection Care instructions, click here. For your free paint protection film, car window tinting, eco-green car wash & detailing, vinyl wraps & graphics, car security & mobile entertainment or any other aftermarket accessory installation quotes, contact Rocky Mountain Auto Works in Sacramento. © 2018 Rocky Mountain Auto Works. All Rights Reserved.